What is the REAL ID? And What Do You Need to Really Get One?Saucon Source	What is the REAL ID? And What Do You Need to Really Get One? What is the REAL ID? And What Do You Need to Really Get One? Note: This story has been updated with additional information about the cost of a REAL ID driver’s license in Pennsylvania. 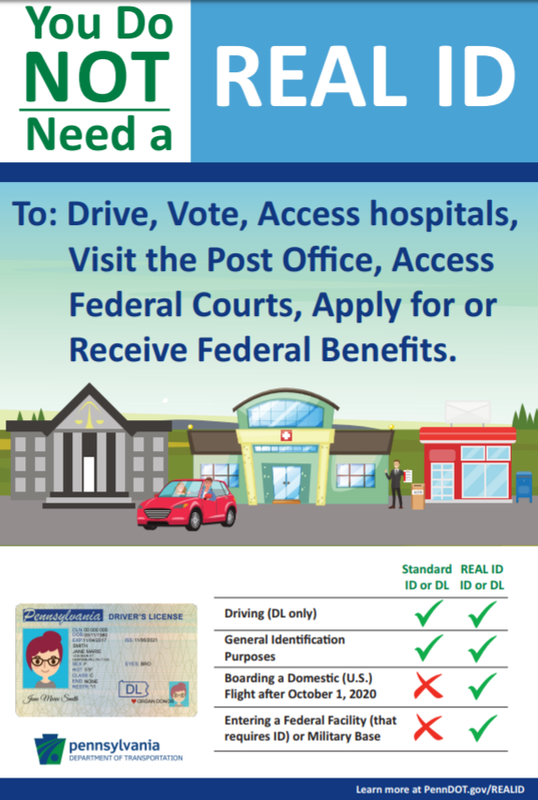 After several stops and starts, Pennsylvania is preparing to roll out its REAL ID program for state-issued driver’s licenses this year, with the first compliant licenses to be issued in March and postcards advertising the new requirements currently being mailed to residents. But first of all, before you get one, what is REAL ID and why might you need one? It’s important to note that REAL ID is actually a national set of standards. It is not a national identification card. The standards for REAL ID were established by the 2005 REAL ID Act, which was enacted following the 9/11 Commission’s recommendation that the federal government “set standards for the issuance of sources of identification, such as driver’s licenses,” according to the Department of Homeland Security website’s FAQ about REAL ID. The Act established minimum security standards for state-issued driver’s licenses and ID cards, and prohibits federal agencies from accepting for official purposes licenses and identification cards from states that don’t meet these standards. That’s why REAL IDs will soon be needed by Pennsylvanians in order to fly. Beginning Oct. 1, 2020, Pennsylvania residents will need a REAL ID-compliant driver’s license, photo ID card or other form of federally-acceptable identification (such as a valid passport or a military ID) in order to board a domestic commercial flight or enter a federal building or military installation that requires ID. These sample driver’s licenses show the differences between a REAL ID Pennsylvania license and a regular license. If you don’t plan to do anything of these things, there’s no need to make the switch. However, if you regularly travel by air or expect to do so after Oct. 1, 2020, you may want to get a REAL ID-compliant license sooner rather than later. The Pennsylvania Department of Transportation has created a checklist of items you will need in order to get a REAL ID-compliant driver’s license, starting in March. You will need to present at least four documents. You must present your original Social Security card when applying for a REAL ID. You will need to provide TWO documents from among the following to prove your Pennsylvania residency when applying for a REAL ID.  Postmarked mail/package labels through USPS, UPS, FedEx etc. If your current legal name, date of birth, or gender designation is different from the information on your birth certificate or legal status document, you must show legal proof of the change. Please note: If you are using a passport as your proof of identity and your passport reflects your current name, YOU DO NOT NEED TO SHOW PROOF OF NAME CHANGE. REAL ID does not create a federal database of driver license information. Each jurisdiction continues to issue its own unique license, maintains its own records, and controls who gets access to those records and under what circumstances. Lastly, what does a REAL ID cost? According to PennDOT, applicants will pay a one-time fee of $30, plus a renewal fee (the current renewal fee is $30.50 for a four-year non-commercial driver’s license or a photo ID). Still have questions about REAL ID and its rollout in Pennsylvania? Visit PennDOT’s REAL ID website and check out the answers to their FAQ.